Dr. King preached, believed and fostered something very important during the Civil Rights Movement: nonviolence. Even in the face of fire hoses, the threats of lynching, assassination and physical abuse, Dr. King was nonviolent. In fact, the gains we made as a society, as African Americans and as Americans in the Civil Rights Movement came through nonviolent protests and actions. Unfortunately, our society has moved away from the teachings of Dr. King and today, we turn to violence all too often. Too many times, in the past decade, and in the past two years we have seen individuals channel hatred or disagreement with others in a violent fashion. A lot of times, that hatred and violence involved a gun. Unfortunately, Dr. King’s concern with ”the potential destructiveness of modern weapons,” has occurred. I ask you, except in times of war, when has gun violence brought about change? Abraham, Martin, John, Bobby and my husband Medgar–agents of change, people who stood up for what they believe in–all opposed violence. These brave men were all struck down by guns. Struck down by people channeling their disagreement and hatred with a bullet and a trigger from the barrel of a gun rather than a conversation and an equitable resolution. Gun violence has affected our country for far too long, and now it has permeated our society so much that individuals are taking the lives of innocent children and everyday Americans going about their usual business, whether it be at their place of education, seeing a movie, or going to their place of worship. I remember, all to vividly, the anger and the hatred that engulfed me when my husband Medgar was taken by an assassin’s bullet. Yes, I was angry with the gunman, I was angry that the father of my children was taken from me far too early. But, more importantly, I was fearful for my children. I was fearful because not only had they lost their father, but they had lost him in a violent way, due to hatred, due to violence, all perpetrated by a coward who disagreed with Medgar’s search for justice and equality. It was this fear that propelled me to fight exceptionally hard to bring my husband’s killer to justice. It is the fear and empathy that I have for all the victim’s families of Columbine, Sandy Hook, San Bernardino, and Charleston that compels me to not sit idly by while our country continues to be wrought with gun violence. We as a nation must change the hearts and minds that violence, particularly gun violence, is not the answer. We cannot let senseless violence caused by guns define us as Americans. President Obama has taken bold and courageous steps that logically address the issue of gun violence, and it is up to us to ensure his proposals are implemented. I applaud the President’s plans, and I stand ready and willing to do whatever it takes to continue his legacy to stem the tide of gun violence. What has happened in the past has happened. It is time for us to reflect and remember, but more importantly it is time for us to heal. It is time for us as a country to stand up and say ‘no more’ to gun violence, and together work to stop all levels of violence. This is important now, more than ever. Dr. King never envisioned a world where innocent children would be gunned down while trying to learn. He never envisioned innocent god-fearing people being struck down while at a church prayer group. In order to heal, we must get back to Dr. King’s guiding principle of nonviolence. Today, as we are celebrating Dr. King, let’s take a minute and reflect on his life, but also rededicate ourselves to stopping the cycle of violence. We can disagree with one another, but rather than pulling the trigger we should have a conversation. Myrlie Evers is the Chairman of the Medgar and Myrlie Evers Institute a non-profit committed to strengthening communities throughout the United States so that all Americans can live a life free of violence, exercise their liberty and right to vote, and pursue advancement opportunities. 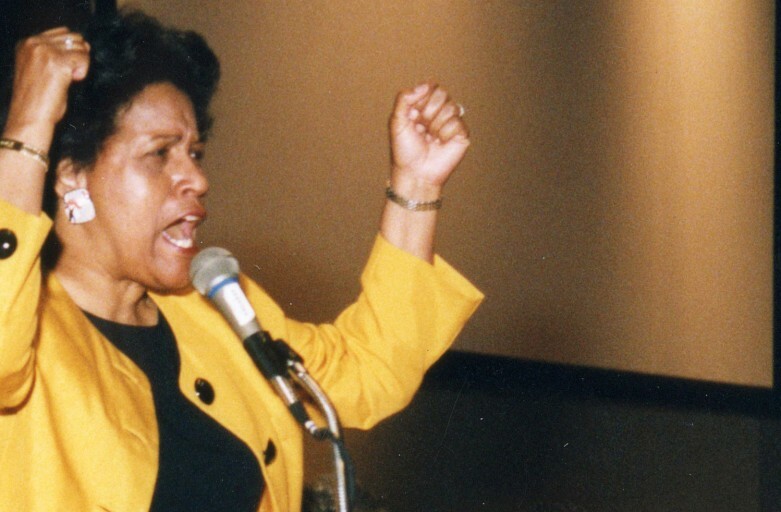 She is also a Chairman Emeritus of the NAACP and the widow civil rights leader Medgar Evers.